All things are possible with God, and EVERYTHING you desire is available to you in Christ's teaching to ask anything in His holy name (John 14:13-14). 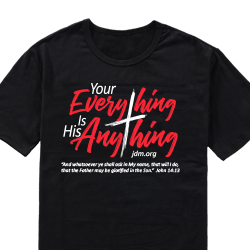 Boldly declare this promise over your life and encourage others to do the same with this inspiring, black, 100% cotton tee. Stay reminded that Jesus is for you and wants you to receive and achieve everything He puts on your heart. Your blessings are the Father's glories!